Bran are thou called, of the glittering branches. Cad Goddeu. Battle of the Trees from the book of Taliesin. The garden of my childhood home backs onto a canal and on its banks alder trees grow. My father built a tree house between three of these trees from which I was easily able to climb the tall, straight, ladder like alders. Sitting up above the world I watched folk walk along the tow path below. To me alder represents a welcoming and supportive presence, a place to commune with the air and the water, thoughts and feelings. Its roots stabilise the banks, its boughs create shady places for water wildlife to flourish below. I learned to easily identify alder by its tiny brown cones for it is the only broadleaved tree to have them. I had no concept then of the processes going on inside these friendly trees. Its specialist adaptations enable it to benefit from the nutrient rich soils found in the watery places it best loves. Uniquely alder trees have a system of air ducts that transport oxygen to the very tips of their roots and the lower part of their trunks contain cork like cells which allow air to enter. Nodules in its roots provide a constant supply of nitrogen, enriching the soil around it. and its wood contains oils which make it highly durable in water. In one year, a square mile of alder forest can extract up to 87 tonnes of nitrogen from the atmosphere and make it available to the roots of its tree friends. It has both male and female catkins; the male rich red and pendulous, the female cone like, turning hard and woody in autumn thus allowing the seeds to fall. These little seeds have their own adaptations; airtight cavities which enable them to float. So, alder easily bridges the worlds of water and land, is often used to make bridges as well as boats, sluice gates and water pipes and alder piles support the city of Venice. Alders access to an abundance of nutrients provides the energy to produce new chlorophyll every year. It therefore does not need to withdraw energy from its leaves in autumn before dropping them and you will not see a change in colour at that time. Fungi and bacteria at the base of the tree recycle the leaves to produce the raw materials needed to build up new chlorophyll. In mythology water can be seen as an entrance to ‘the other world’. So here we find the place where encounters may take place and even battles, as in Cad Goddeu The Battle of the Trees between the lords or Gods of the underworld and the immortals. The text quoted above is an englyn sung by Gwydion the sorceror whose name is derived from the Welsh word for tree, gwydd and also gwyddon meaning magician. In order to defeat the warriors of the otherworld Gwyddion has to discover the name of the one who is unnamed, whom as it turns out is called Bran. He carries a shield bearing ‘the high sprigs of alder’. We don’t know for sure who this Bran actually is but interestingly Bendigeidfran or Bran the Blessed of the 2nd branch of the Welsh Mabinogion steps into an enchanted river making a bridge of his back. He also has a nephew called Gwern, meaning alder. So, alder, with its kingly purplish buds has royal connections. Perhaps we too can come to grips with otherworldly matters, make a bridge between the place of wisdom and inspiration to our everyday lives by understanding and working with the energies of trees? 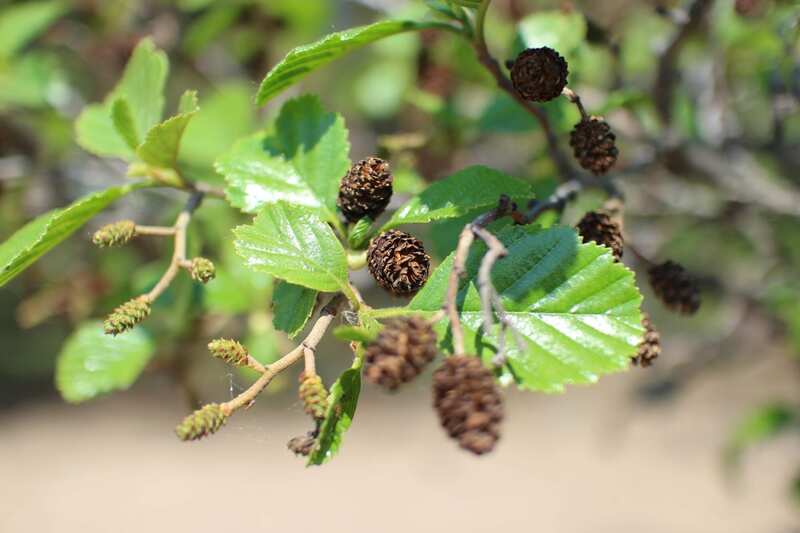 Alder has been traditionally used to make hot burning charcoal which was used to forge ritual weapons. Its white inner wood turns reddish pink when felled and this bleeding sap makes a fiery red dye, once used like woad to redden the face of warriors. This quality of bleeding led to alder being considered sacred in ancient times and to represent the generosity of the gods and health of the land. A beautiful green dye is produced from its flowers and its leaves were once used to tan leather. An alder bough is easily hollowed out to make whistles and pipes and the fine grained, water resistant wood makes excellent bowls and plates as well as clogs. Medicinally it is useful for burns, sore throats, mouth ulcers, bruises, swellings and inflammation. Alder leaves put into the shoes refreshes weary feet and for relief from rheumatism fill your duvet with the leaves. What a lovely thought, though be careful as alder is also associated with passion! So, after all these yearsI have learned so much more about alder than I could ever have imagined to be the case. How much more is there to discover, not just about alder but all trees? Time by the Cefn Coch river with the Bwlch Corrog alders may reveal more. We gratefully acknowledge the support of Tilhill Forestry Ltd in donating site survey reports to Cambrian Wildwood.